Between PC, Xbox One and PS4, I've got more than 60 hours logged in Call of Duty: Ghosts. Six of those hours is Story Mode. None of it is competitive multiplayer. I've been playing Extinction, the most satisfying Call of Duty experience I've had in years. I nearly missed out on Extinction altogether. After spending six hours plodding through a new take on the same old Call of Duty story – someone's done something incredibly bad and needs to be shot in slow-motion – I was ready to lay my copy down and go about my business. While I've had my moments, I'm generally bad enough at first-person shooters to draw insulting comments from less-than-civil teammates, so playing in a competitive environment wasn't an attractive prospect. That left Point of Contact, the prologue to a Neversoft-developed episodic "alien" cooperative mode that would play out over the course of four downloadable content packs. I'd toyed around with the Zombies co-op mode in Call of Duty: Black Ops 2 the previous year, and while I enjoyed the camaraderie, I wasn't too keen on the zombie enemies. And so I passed on Point of Contact. I put up my copy of Call of Duty: Ghosts for the Xbox One and didn't come back to it until a couple of months into 2014. A redecorating project left all of my consoles offline save the Xbox One, so I gave Extinction mode a try. The first thing I heard over my headset after watching the brief cutscene preceding Extinction's Point of Contact prologue was that 13-year-old voice – that barely pubescent teenage tenor that is, to a novice Call of Duty player, normally an indicator that insults are on the way. I steeled myself for the oncoming storm. As we advanced through the post-atomic town of Caldera Peak, Colorado, carrying a drill from nest-to-nest, protecting it while bestial "aliens" swarmed our position, that 13-year-old voice carried us along. He encouraged our team to hold steady when it looked as if we'd be overwhelmed. He told us not to worry, and that "we've got this." Between rounds, while the team gathered weapons and transported the drill to the next nest, that 13-year-old voice told us we were doing a great job. He addressed us individually by our Xbox Live handles. He noticed my rank was low and gave me instruction on what was going to happen next. "In this next one we just have to keep them from attacking the helicopter as it takes down the blockade." Together our team advanced into the town proper. We held fast through the cabins on the outskirts. We made it all the way to the crater, where we needed to destroy the final nest and activate a nuclear bomb. We didn't make it. There were too many of them. The thirteen-year-old voice let out a disappointed "Oh man! We were so close!" I didn't have my microphone connected – until then I rarely did – so I thanked him silently. As the round ended his final words were "Don't worry. We'll get 'em next time." It's easy to get swept up in the moment in competitive multiplayer. Virtual lives are on the line. Reputations are on the line. All too often players let their frustration get the best of them, which makes for a poor new-player experience. It's different in Extinction. It's four players, each depending on the other three to ensure they make it out of an impossible situation alive. We go in together, and one way or the other, we're going out together. It really helps to have that 13-year-old voice cheering you on. Here's how Extinction works. Each level presents the players' team with a series of tasks to complete. For example, in Point of Contact players must carry a heavy drill from Cryptid nest to Cryptid nest, defending it while it worked its destructive magic. Players earn money for kills and completing objectives, which can be used to deploy turrets, ammo, explosives and other handy devices, purchase more powerful weapons or activate special traps to help thin enemy numbers. Skill points, as the name implies, are used to upgrade skills during a match. They're earned by completing objectives (destroying a hive) or completing optional challenges. Things like "Don't reload your weapon for the first 60 seconds of the wave" or "Kill 24 scouts with melee damage before the round ends." Consider them team-building exercises. Gaining ranks in Extinction unlocks new skills, classes and supplemental equipment for the player to bring into each battle. To me this is so much more satisfying than unlocking a new gun to be holding or perk that won't help me as I get shot in the head repeatedly during online multiplayer. The more one plays Extinction, the better everyone's chances are of getting to the end of the story. 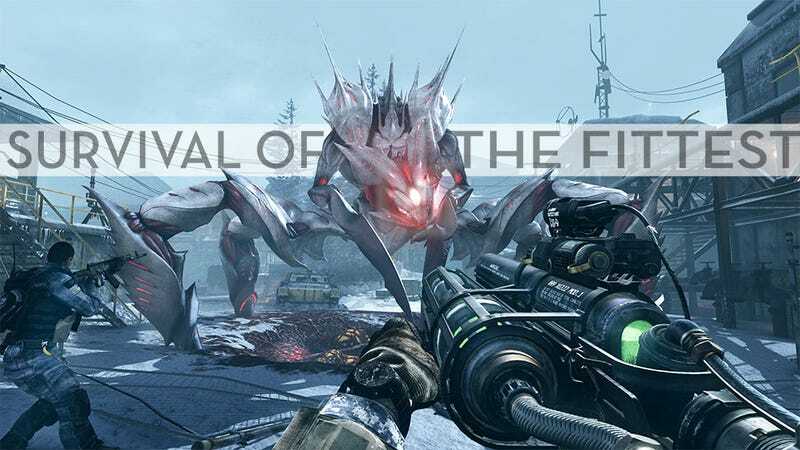 It may seem like a completely different set of events, but Extinction mode is directly linked to events that go down in Call of Duty: Ghosts' formulaic story. When the Federation (bad guys) assault the ODIN space station at the beginning of the game, causing widespread destruction to North America's North and Southwest, a stray missile hits the small mountain town of Caldera Peak, Colorado, unearthing the Cryptids. Extinction mode is often referred to as "Alien Mode", but the Cryptids aren't technically aliens. They're an Earth species that predates the dinosaurs. By the time a stray comet ignited the planet's atmosphere, eradicating the mighty lizards, the Cryptids and their masters, the Ancestors, had already retreated below the surface. There they laid dormant for millions of years, until the events of Ghosts' story mode roused them from their slumber. With the world erupting into chaos, the Cryptids and their masters decide it's the perfect time to reestablish global dominance. Over the course of Extinction's five episodes – Point of Contact, Nightfall, Mayday, Awakening and Exodus – we're introduced to characters far more interesting than the cardboard cutouts from the main story. We've got David Archer, a top man in Britain's Special Air Service, who's been obsessed with the Cryptids since an early run-in with the creatures following a mission in Pakistan. When his superiors write off his "alien" encounter as the result of a traumatic head wound, he gathers a team of top scientists and founds the Nightfall Program to research the species. One of the scientists he recruits is Samantha Cross, a master of linguistics. Brought on to help decipher the Cryptid's writings, she becomes infected by a mimetic virus that effectively places her under the control of the Ancestors. She's a little bit Kerrigan from StarCraft, only without all the spiky bits. The story of Extinction is the story of Archer, Cross and how they deal with a very real threat of human genocide. It does not end well at all. The player's four-man squad plays through key moments in this unfolding saga. They're in Caldera Peak, site of the initial appearance of the Cryptids. They attempt to rescue Dr. Cross from the Alaskan headquarters of the Nightfall Program, following an outbreak that's left more than 100 people dead. They board an abandoned oceanic research vessel, facing off against the Cryptids' ancient and massive aquatic protector, the Kraken. They infiltrate a Cryptid hive, searching for an artifact that could be the key to combating the Ancestor's power. Ultimately they're responsible for ensuring humanity has a chance to survive. No pressure. What a lovely surprise, finding this intriguing science fiction tale buried beneath the competitive multiplayer chaos, tucked behind a single-player mode that's once again more spectacle than story. How sad it required four DLC packs to experience it. The Call of Duty franchise is often cited for its lack of evolution and originality. It's not that those elements aren't present in Ghosts; they're just hidden, perhaps in fear of alienating (pun intended) a core audience that's come to expect more of the same. As we get closer and closer to the launch of Advanced Warfare, the next yearly installment of the Call of Duty franchise, it gets harder and harder to find other people to play Extinction with. It seems a bit easier on consoles than on PC, but not by much. I've tried playing in solo mode, but without other people the magic just isn't there. It feels like my favorite Call of Duty game is about to die. Advanced Warfare's Exo Survival mode, in which four-players battle alternating waves of enemies, sounds lovely, but I it won't be the same. All I can do is hope one of the next entries in the franchise is Call of Duty: Ghosts 2, and I can find out what happens next. Wow. I'm actively looking forward to a new Call of Duty game… for its story. Now if only it were the main story.